Here we go again. Rihanna and Drake, have split again, multiple sources confirm to Us Weekly. The pair have been dating on and off for seven years now, with multiple partners in between. And it appears to be Rihanna who's deciding to keep things from getting too serious. "She doesn't want to be held down," a source close to the Barbadian beauty said. A second insider adds, "They will always be close. If they end up together, it could happen, but not now." The Rapper wasted no time moving on. Drake, 29, was recently spotted out with model India Love, who previously dated rapper The Game. Just last month Rihanna, 28, and Drake made their relationship official again after a summer of love. "They're together and he loves her," a source said at the time. "Needed Me" singer while presenting her with the Michael Jackson Video Vanguard Award at the 2016 MTV Video Music Awards. "She's someone I've been in love with since I was 22 years old," he told the audience before giving Rihanna a quick kiss on stage. It was a romantic moment that warmed the heart of their fans—but it didn't last. 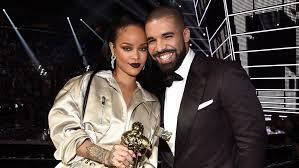 Days after the award-winning , while in New York City, the pair got matching tattoos of a plush shark that Drake bought Rihanna at a Toronto aquarium earlier in the summer.